FOIA the Mueller Report: What will the Special Counsel’s Office release? 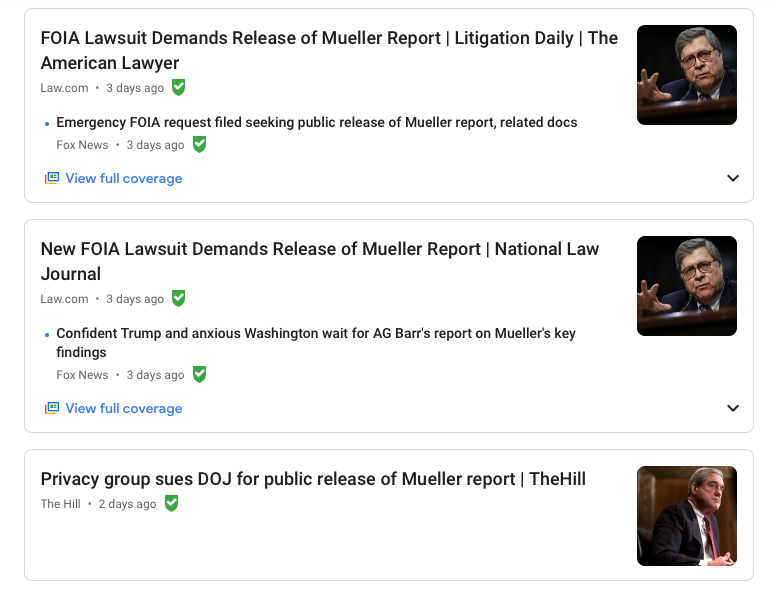 It’s been just three days since Special Counsel Robert S. Mueller III passed his report on to Attorney General William P. Barr, and already Freedom of Information Act lawsuits are flying. Here’s what’s likely to be released and how you can follow along for instant updates on related requests. First, the good news: FOIA is likely to help net some new insights into Mueller’s nearly two-year investigation into Russian interference in the 2016 election and possible coordination between President Donald J. Trump’s campaign and foreign powers. The bad news: There will almost certainly be a lot that public records requests won’t tell us, due to various exemptions that allow withholding material. Yesterday, Barr released a four-page summary of the Special Counsel’s report. As part of that report, Barr specifically highlighted one of the issues blocking the release of the full report: Federal Rule of Criminal Procedure 6(e). 6(e) bars the release of grand jury material and is considered an FOIA Exemption 3 carveout, since it is a law that specifically exempts (in fact, criminalizes) information from release. The court might authorize disclosure of 6(e) evidence for a presidential impeachment by invoking common law “inherent authority.” Several courts have taken the position that they have inherent authority to go beyond the strictures of Rule 6(e) and release grand jury information—records relating to the investigation of Chicago Tribune staff members for espionage in 1942, for instance, as well as former president Richard Nixon’s testimony from 1975. “[A] district court retains an inherent authority to unseal and disclose grand jury material not otherwise falling within the enumerated exceptions to Rule 6(e),” Judge Beryl A. Howell ruled in April, granting CNN’s request to unseal some documents from the Starr investigation. Judge Howell’s views matter: As the chief judge of the U.S. District Court for the District of Columbia, she is supervising Mueller’s grand jury in Washington, and she would be the one to rule on any request to disclose 6(e) evidence from the investigation. Given that Mueller ultimately did not draft an impeachment report, it seems even less likely that the grand jury secrecy rules will be set aside. FOIA Exemption 1: This exemption covers materials are that properly classified in the interest of national defense or foreign policy. Since much of the Mueller report was focused on foreign interference, it was often a counter-intelligence investigation. A lot of this information is likely still classified. It might also be an opportune time to note that the president is the ultimate classification authority. FOIA Exemption 5: The “deliberative process privilege” exempts information used to help guide agency decision making. Kel McClanahan, executive director of National Security Counselors, wrote that it was conceivable the Department of Justice could exempt the entire report using (b)(5), arguing they are “withholding of a report which is solely intended to inform the AG’s decisionmaking.” Conceivable, however, does not mean likely. Using exemption 5 in such broad strokes would likely lead to more legislative backlash than they’d like to deal with. They'd win the case but at the cost of every other DPP case ever. FOIA Exemption 7: This covers a range of law enforcement-related materials, ranging from special techniques to details that would jeopardize an ongoing investigation (of which there are many, they just happen to now be outside the Special Counsel’s office) to materials gathered that could constitute an unwarranted invasion of privacy. So what can be released and how? Given all the above, it’s highly unlikely that the full Mueller submission to Barr will be released via FOIA. Given the widespread public interest and demands from lawmakers for the release of the information, it’s also likely we’ll see large chunks of it released via Congress or leaks sooner than it will be via FOIA channels, particularly given the average 97 day Department of Justice response time. But that doesn’t mean that FOIA requests aren’t still worth pursuing for a number of reasons. First, it’s worth checking out the two (publicized) early lawsuits for copies of the report and related materials. but the requests generally focus on something a bit different: Materials that were prepared to be shared or actually shared for parties either outside of the Special Counsel’s Office or outside of the DOJ completely. Particularly with requests that are written with lawsuits in mind, requesters often start broader and then narrow the requests down through the litigation process. Thus, even if the Mueller report itself is found to either be exempt or if it’s ultimately released, their requests are primed to help shed more light on the reports generation and dissemination by focused on intersections (points where the DOJ has weaker standing since it’s already been shared) and process (akin to metadata that shows us the outlines of the Special Counsel’s process while not requiring disclosure of material that would be categorically exempt). Even if these requests do not directly result in the release of the full report, FOIA requests can also highlight public interest in releasing information, often resulting in political interventions. One high profile example: The request for the White House beer recipe, which succeeded despite the White House being exempt from FOIA. With FOIA, the best approach is often an orthogonal one.